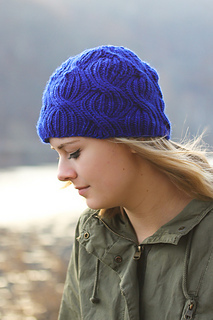 A close fitting, reversible ribbed hat, Azul has alternating cables that decrease in width until they disappear at the crown. 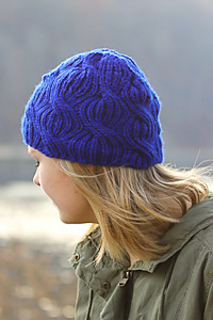 The clean, sculptural lines of the ribbed cables and the beanie fit make Azul a perfect hat for everyday. 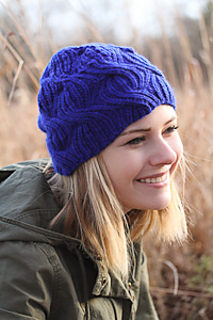 Techniques & Skills Used: cable CO, knit/purl, decreasing, cables, knitting in the round; this pattern contains written instructions only. Size: 18” brim circumference and 8” crown, unstretched. 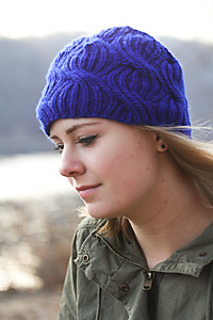 Yarn: Malabrigo Yarn Merino Worsted (100% merino wool, 210 yards/100g); 1 skein, shown in Azul Bolita. The sample as written used 125 yards. Other Materials: US 9 (5.5mm) 16” circular needle or dpns, or size to match gauge; Cable needle; Stitch markers (8, one different color); Yarn needle. 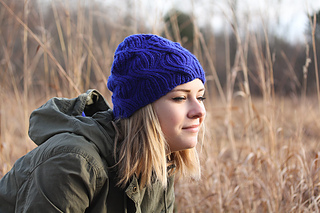 Gauge: 21 st and 28 rows/4” in unstretched K1P1 Rib.